A Cambodian solider looks across at the Thai border from the ancient Preah Vihear temple where a military camp has been set up February 9, 2011 in Preah Vihear province, Cambodia. United Nations (CNN) -- The U.N. Security Council Monday called for a truce between Thailand and Cambodia and urged the two Asian nations to begin a dialogue to end their dispute over an ancient Hindu temple on the border. The council issued its statement following a closed-door session on the conflict that included representatives from both sides and the Association of Southeast Asian Nations (ASEAN). "The members of the Security Council called on the two sides to display maximum restraint and avoid any action that may aggravate the situation," said the statement, read by Ambassador Maria Luiza Ribeiro Viotti of Brazil, which holds the monthly presidency of the 15-member body for February. "The members of the Security Council further urged the parties to establish a permanent ceasefire and to implement it fully and resolve the situation peacefully and through effective dialogue," she said. Border skirmishes, which started earlier this month, have killed five people, including members of the military and civilians, a statement from ASEAN said, adding that each nation accuses the other of firing first. 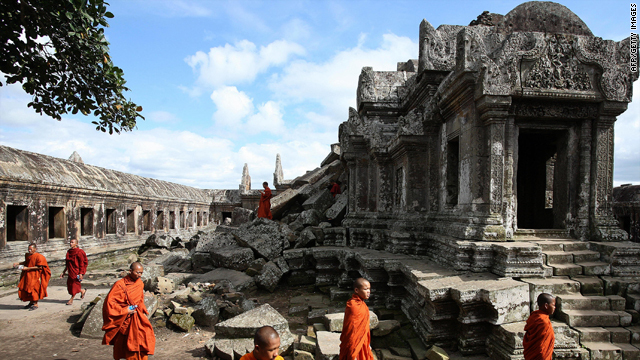 The clashes stem from a longstanding conflict related to the 11th-century Preah Vihear temple. The building sits on a cliff in Cambodian territory, but the most accessible entrance to the site is on the Thai side. In a letter to the United Nations last week, Cambodian Prime Minister Hun Sen said that in addition to the human toll the fighting was taking, the temple had suffered damage. Conflict over the Preah Vihear site has taken place periodically for years. In 1962, the International Court of Justice in The Hague, Netherlands, ruled that the site was in Cambodia, adding that the structure was "an outstanding masterpiece of Khmer architecture." But Thailand says the 1.8-square-mile (4.7-square-kilometer) area around Preah Vihear was never fully demarcated, and blames a map drawn at the beginning of the 20th century during the French occupation of Cambodia. In July 2008, the United Nations approved Cambodia's application to have the temple listed as a World Heritage Site, meaning the U.N. believes the place has outstanding universal value. Monday's meeting followed a request by Cambodia for an emergency session of the Security Council. The council heard from Under-Secretary-General for Political Affairs B. Lynn Pascoe and Marty Natalegawa, the minister of foreign affairs of Indonesia and chairman of ASEAN. Hor Namhong, Cambodia's deputy prime minister and minister of foreign affairs and international cooperation, and Thailand's foreign affairs minister, Kasit Piromya, also addressed the council. The council also expressed its support of ASEAN's efforts to bring the two sides together to find a solution. ASEAN foreign ministers are expected to discuss the conflict at their next meeting on February 22.